Strike King’s Rocket Shad® is built for speed. You can cast it farther, retrieve it faster and cover more water than ever before. It is the perfect schooling fish lure and a great drop bait too. This lure runs perfectly in fast current conditions which makes it terrific in rivers. It perfectly imitates the most common baitfish — the Shad. Many different species of fish are attracted to it. Try a Rocket Shad® and watch fish hit their afterburners to catch one! 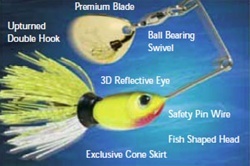 All colors have nickel blades, except chartreuse shad which has a gold blade.